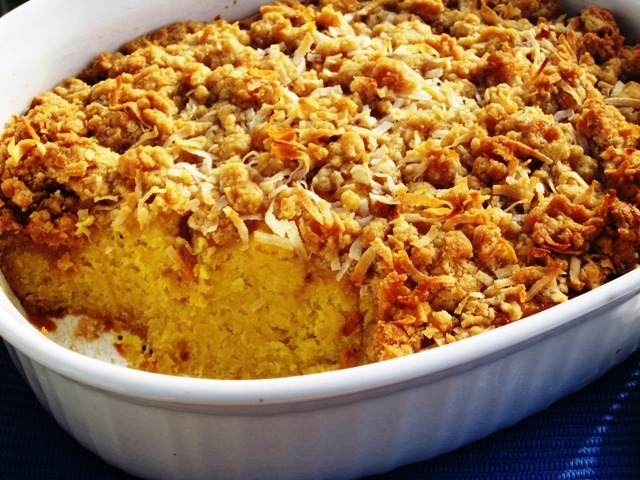 This recipe was inspired by mother-in-law’s sweet-potato casserole. I had some ripe plantains at home and I wanted to make something with an American twist and my mother-in-law makes a delicious sweet potato pie. 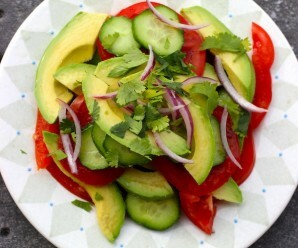 So, I decided to create something similar, but with ripe plantains and coconut. Enjoy! Bake the bake plantains for about 25 minutes. Let them cool and peel. Mash the plantains and add the eggs, ground cinnamon, coconut milk, ½ cup melted butter and sugar. In a medium bowl mix all the topping ingredients, until well combined. 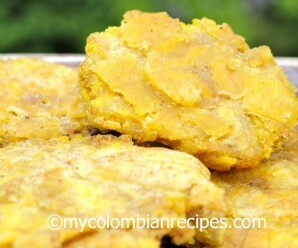 Sprinkle over the plantain mixture and bake at 350°F for about 40 minutes or until golden brown. Serve. I want to thank Ivy from “Kopiaste” for the “yummylicious Food Blog award”. Interesting twist with the plantains! My wife might like this, she’s loves sweet potatoes. Have you had Torta de Plantano Zuliana?? It’s a great mixture of butter fried ripe platanos, white cheese, beaten eggs and cinnamon – layered lasagña style. Think you’d love it. Jane- Yes, I have torta de plátano in my recipe list. This looks really great. Plantains are so much like potatoes that the texture would be similar. Our favorite is still plantain chips and just plain roasted plantains. Never have had a good recipe for that, though. That looks delicious. I never cooked with plantains, it’s good to know you can make sweets with it. Fantastic.. we have a lot of plantains where I come from and have always loved it. This is a fantastic variation to add to my stash.. thank you.. Thank everyone! I appreciate all your comments. 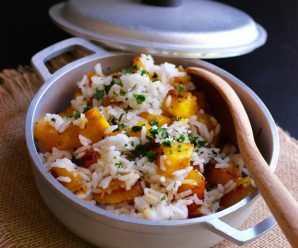 Although I have never eaten plantain before as we don’t get it in Greece, your casserole looks delicious. Sounds delicious! I am looking forward to preparing this for my family this holiday season. 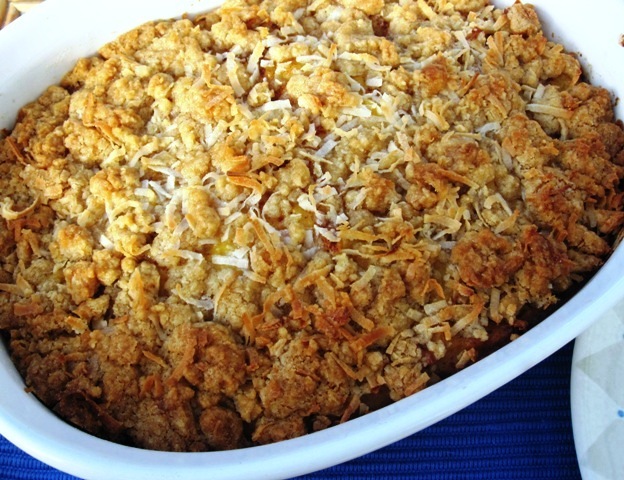 The minute I saw this title in my RSS, I knew I was going to love it…especially the toasted coconut topping. Mouth watering recipe, Erica !!! Oooh that casserole looks so good! I love plaintains – I may just put this on the Christmas dinner menu! You have a wonderfully talented mother-in-law by the looks of it. I love the sound of this recipe – we love plantains and coconut, and this dish looks perfect. I adore plaintains, both ripe and green! This looks like an incredible recipe, I love that it calls for coconut milk. The casserole looks like it was cooked so perfectly. You had a great idea using the plaintains in place of sweet potatoes, very original! Wow this looks rich and amazing! Great photos too! This is a great twist! It looks delicious! And, it is to die for. Looks delicious! Our plantains are almost ripe and the coconuts are everywhere. Will have to give this a try. Thanks Erica! I have tried a lot of your recipes and everyone of them turns out DELICIOUS!!! I want to try this one next. 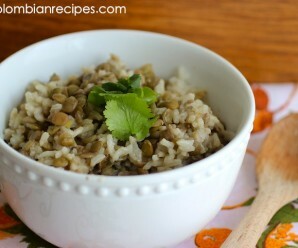 Do you have this recipe with meat in it? Platano Maduro con carne sounds yummy. Great job on your website. Thank you so much for sharing your recipes!!! Gracias Erica!!!! This is exactly what I was thinking, I’m very excited to try this recipe!!!! Gracias Erica!!!! I can’t wait to try it!